L 62″ (158 cm) W 108″ (274 cm). 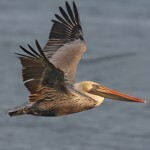 Adult Pelicans are usually silent, but sometimes utter a piglike “grunt.” Young have low, whinning grunt. Flys with head drawn back. Adults very large, mainly white with black wing tips, yellow feet; unfeathered yellow throat pouch and dull, yellow bill. Immatures duskier, with gray bills. Behavior: Scoops up fish while swimming by submerging head and neck. Does not plunge dive. Habitat: Large marshes, lakes and reservoirs are used by migrating and non-breeding birds. Where in Nebraska: Abundant regular spring and fall migrant statewide, non-breeding birds will summer in Sandhills and large reservoirs; locally rare regular winter visitor in Kieth and Lincoln County. Large Sandhills lakes and reservoirs like Lake McConaughy and Merritt Reservoir may attract Pelicans during the summer months. 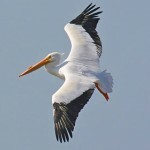 Less commonly, White Pelicans will use sandbars in the Platte River. Fun Facts: American White Pelicans do not dive for fish but rather dip their heads in and fill their bills. Sometimes many pelicans will fish together circling in the water to congregate fish and then dip their heads simultaneously.